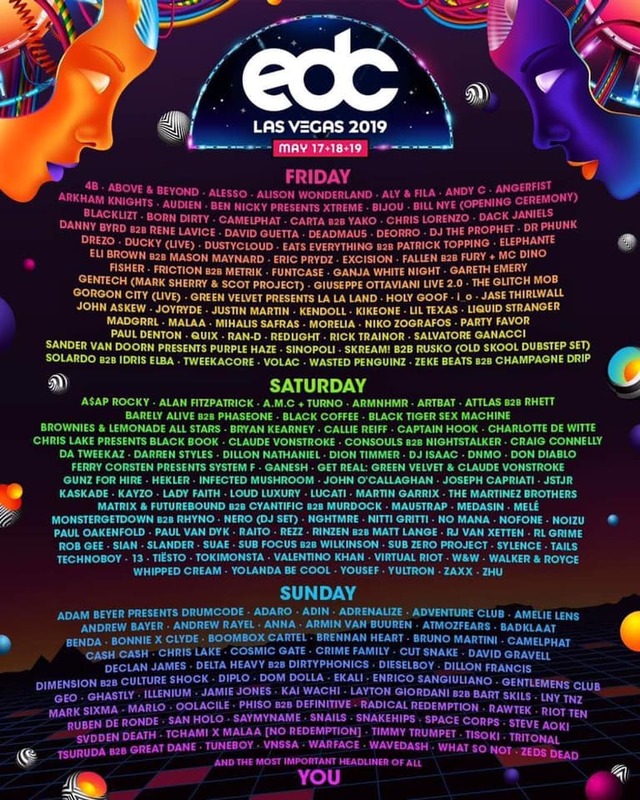 Electric Daisy Carnival in Las Vegas always brings in easily the biggest dance festival lineups of the year and this year is no different. Just recently they brought the EDC LV lineup to life through the theme of Kinetic Energy by special host Bill Nye the Science Guy. With his presence being influential to EDC’s theme this year, they have brought him to be the opening ceremony kicking off the whole festival! This performance slot is one of the most sought out from EDC goer’s as it sets everything in perspective at the main stage, the Kinetic Field, for what is to be expected from the rest of the weekend. So far we have the full daily lineup for this years EDC Las Vegas which can be seen in the graphic above. Honestly though the lineup is just all around epic, from having every mainstream artist you can practically think off mashed along side with up & coming superstars, to legendary producers, underground acts of all types, and so many more. Every genre of electronic music can be found here from Hard-style, to DnB, Dubstep, Trance, House, Trap, and then all the sub-genres of those as well. All of which will be boasted on some of the most mind melting, biggest stage productions in the world! Seriously a EDM lovers wonderland and a bucketlist festival that should be on everyones list. Here are some of the trance / techno / house b2b’s that will be going down! GENTECH (Mark Sherry & Scot Project), Carta b2b Yako, Solardo b2b Idris Elba, Get Real (Green Velvet & Claude VonStroke), Monstergetdown b2b Rhyno, Rinzen b2b Matt Lange, Layton Giordani b2b Bart Skils, and Tchami x Malaa. The DnB b2b’s are rather fantastic too: Danny Byrd b2b Rene Lavice, Fallen b2b Fury + MC Dino, Friction b2b Metrik, Matrix & Futurebound b2b Cyantific b2b Murdock, Consouls b2b Nightstalker, Subfocus b2b Wilkinson, Delta Heavy b2b Dirtyphonics, and Dimension b2b Culture Shock! The last group of announced b2b’s are for the dubsteap heads and the bass lovers. Starting the an OG b2b with Rusko b2b Skream!, Zeke Beats b2b Champagne Drip, Barely Alive b2b Phaseone, and Tsuruda b2b Great Dane! This entry was posted in Music Festivals, News, Previews & more and tagged Deadmau5, DnB, Dubstep, EDC, EDC LV, EDM, Electric Daisy Carnival, House, Las Vegas, Mainstream, Tiësto. Bookmark the permalink.